Ragusa is a distinctive but fascinating city full of art and history: divided into two parts, it is a mix of art, beautiful architecture, genuine food and breath-taking landscapes that you will love with ease. 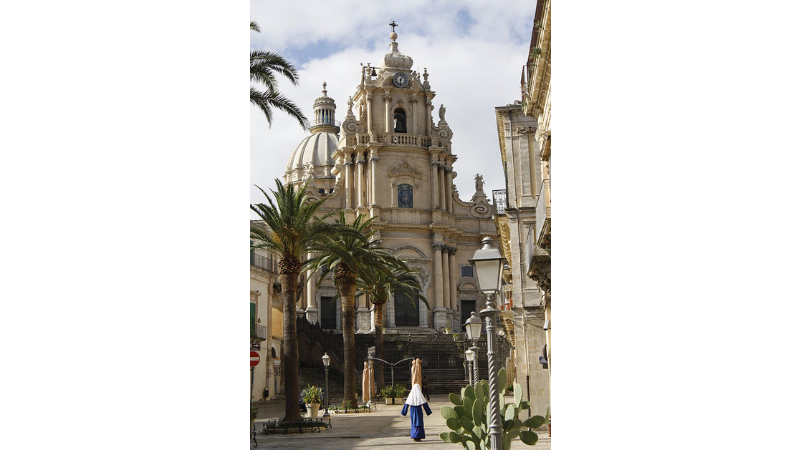 The attractive churches with their predominantly Baroque style allowed the town to become a UNESCO World Heritage Site as a part of the “Late-Baroque Towns of the Val di Noto (South-Eastern Sicily)”. It is certainly one of the towns that cannot be missed during your trip to Sicily. Over the millennia, Ragusa has seen several populations settle in the area, as indeed in the rest of Sicily. The earliest remains of the town date back to the II millennium B.C. when the Sicels colonized all of Eastern Sicily. Hybla Heraea was the original name of the settlement that today is the modern town. Hybla is the Sicel name given to the goddess of earth and fertility. The city was located on a hilltop to resist enemy attack. Soon the first Greek colonists arrived and the Sicels allied themselves with Camarina, a colony founded by Syracuse and which later rebelled against it. The Roman Empire made the city pay tithes for protection though not even when the barbarians arrived the city stayed safe: Hybla was, in fact, razed to the ground. Only when the Byzantines came did the city finally enjoy a period of stability, it was strengthened with fortifications and a stronghold was built as a line of support in the defence and protection of Syracuse. 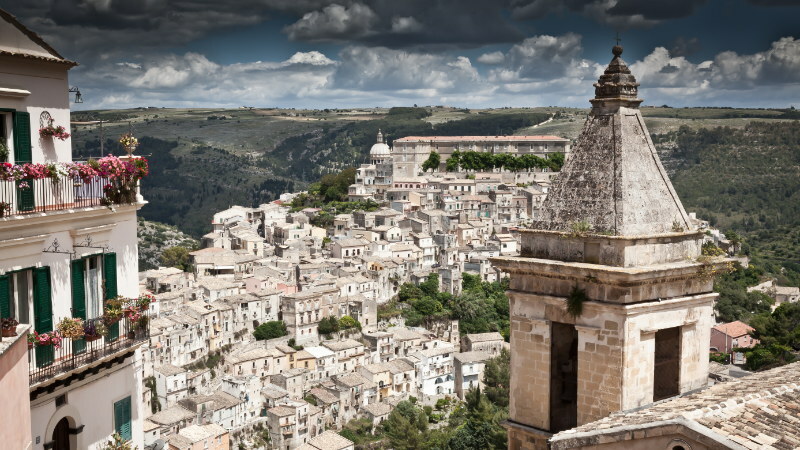 In this period the city changed its name to Ragusa. The Arabs tried to conquer the city more than once but Ragusa resisted until it was finally occupied in 848 A.D. The Arabs ruled the city until the 11th century when a violent rebellion favoured the advent of the Normans. The main event in Ragusa’s history was the Earthquake of 1693: a terrible catastrophe that killed more than 5,000 townsfolk. It was decided to rebuild most everything in the style that we can appreciate today: the new town of “Ragusa Superiore” was built on the hill where most of the population moved to, whereas the aristocracy sustained the reconstruction of the old “Ragusa Ibla” not wanting to leave their prestigious though precarious mansions. Luckily many of the buildings damaged by the earthquake were restored and preserved for posterity so that they can still be appreciated today. The Upper Town of Ragusa Superiore has elements of modernity but preserves some buildings of the Baroque age and it was independent until it merged with the old town in 1927, becoming together with the provincial capital. The main sight to see in the upper town is Ragusa Cathedral dedicated to Saint John the Baptist (“San Giovanni Battista”). It was built in the early years of the XVIII century after the former building erected on the same site wasn’t considered appropriate. Originally the Mother Church was located in the old town, under the walls of the Medieval castle, where today we find the church of St. Agnese. The Cathedral has a beautiful elaborate Baroque façade with an impressive main entrance with rusticated columns. The master masons recreated several elements from the Baroque monuments of Acireale and Catania, thus, the building has some similarities with them like Acireale Cathedral’s marble portal. Within we can admire the 19th and 20th-c. stucco decoration in the side chapels. Nearby, the beautiful Baroque “Casa Canonica” with ornate balconies. Ragusa Cathedral is located between Via Roma and Corso Italia, the main streets of the Upper Town and a stroll along these afford views of many pleasing façades. Nearby, the “Museo Archeologico Regionale Ibleo” preserves the history and archaeology of Ragusa. It hosts several artefacts from the prehistoric period, as well as from archaic and classical Sicilian dwellings, the Hellenistic and late Roman settlements. The prestigious Castiglione Warriors is a VI century-BC base-relief representing a lookout on the Iblei Mountains charged with the protection of Camarina. Its importance is due to the Greek characters and Doric incision: it was exhibited in Berlin’s Pergamon Museum in 2003. Proceeding from Corso Italia to Corso Mazzini, you reach the old town: a winding though suggestive route will lead you to discover the ancient core of Ragusa full of churches and old mansions. The Cathedral of San Giorgio is one of the most important sights in Ragusa and the main place of worship in the city. Built by the architect Rosario Gagliardi in 1738, it is a majestic symbol of Sicilian Baroque with its incomparable portal in the Catalan-Gothic style. From the steps, we can admire the façade divided into three parts by the ornate columns, the Neoclassical dome more than 40 meters high and the typical decorative motifs of the Baroque style. Inside the central nave of the Cathedral, there is work illustrating St. George’s martyrdom. Though the church was completed in different periods, the whole structure appears harmonious and admirable. The location of the Cathedral in Piazza Duomo is the very heart of Ibla, the starting point to explore Ragusa’s historic town full of narrow streets and charming sculptured balconies, as well as bars and restaurants for all tastes; a stroll around the old town can be very romantic. But if you prefer not to walk there is a sight-seeing service departing from here that will explore the main streets. Or if you just want to enjoy the place, you can sit down in one of the cafés and have a drink. Only 4 minutes away from Piazza Duomo there is another must-see church in Ragusa, the “Chiesa di San Giuseppe”. Its façade is similar to that of the Cathedral, so it is probably this building can also be attributed to Rosario Gagliardi, though it is different for its elliptical interior. The church contains a treasure of Baroque works, some stuccos and paintings and an ornate silver statue of Saint Joseph dating to the XVII century. Located between the old and the new town, the church of Santa Maria delle Scale is a 15th-century building with numerous chapels and an amazing panoramic view over Ibla. It incorporates different architectural styles, mainly because of the 1693 earthquake. The interior has one nave in the Gothic-Catalan style and this is the original part together with the portal in the right aisle, while the other half was rebuilt during the Baroque period. Standing on the terrace and admiring the whole of the old town from above will probably be one of the best emotions on your Sicilian journey. Another church dedicated to Saint Mary is Santa Maria dell’Itria. The Knights of Malta came here in 1639 and erected the church, in fact, the portal bears their cross, symbol of the order. The church was not damaged by the earthquake, but in the 18th century, it was modified with Baroque elements to modernize it. The interior is lavishing and the ornate altar gleams; over the presbytery altar there is a painting illustrating the Madonna dell’Itria, a depiction derived from the Greek Hodegetria called also “Our Lady of the Way”. If you want to visit the surroundings, know that there are lots to see and do, especially if you are a TV series fan or simply a beach lover. 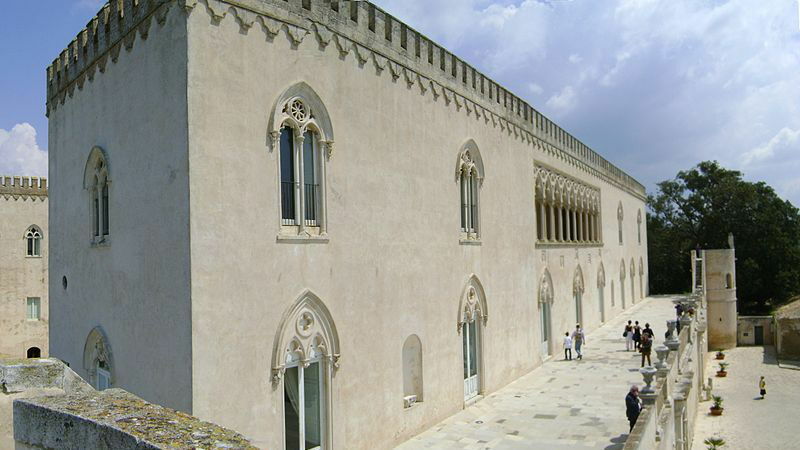 Only 9 miles from Ragusa is the Donnafugata Castle, one of the most spectacular sights in the area. Originally built in the XIV century, it underwent several changes before assuming its present aspect. There is a legend about the name of the castle that claims Queen Blanche of Navarre was hiding here from Count Bernardo Cabrera who was intent on marrying her and take over the leadership in Sicily; while he was trying to imprison her in the castle she was able to escape into the surrounding countryside. Donnafugata stands indeed for “fugitive woman”. Despite the legends, the castle is fascinating in itself: a Neo-Gothic jewel with square towers. The whole structure is charming, not only inside but also the gardens: visitors can experience a walk through the labyrinth or through the dense, exotic greenery of the park or chance upon the Grotto. The setting so charming that the castle was the location of films like Matteo Garrone’s Tale of Tales or of some episodes of the world famous TV series Inspector Montalbano. After all, the stories of the Sicilian “Commissario” are filmed in several places of the surroundings, like the seaside town of Punta Secca and Ragusa Ibla, thus the city and its surroundings became the most sought-after film set in Sicily. And speaking of beaches, Marina di Ragusa is the city’s beach district where you can swim and relax under the sun. A daily bus service from Ragusa takes you to the seafront where you can enjoy a delightful walk admiring the golden, sandy beach. The beach is well maintained and has several well-equipped beach clubs. After spending time at the beach, you can explore some more. The town is humming, especially during the summer, and it is a destination known for its nightlife as the seafront becomes a rendezvous for those who want to spend the night eating, drinking, and having fun.